Delicious light and spongy angel food that is suitable for a gluten-free diet. This is a guide about gluten free angel food cake. Beat egg whites (at room temperature) and salt until foamy. Add cream of tartar; beat until soft peaks form. Add 1 cup sugar, 2 tablespoons at a time, beating until stiff peaks form. Spoon the batter into an ungreased 10-inch tube pan. Bake at 375 degrees F for 30 to 35 minutes. Invert cake and cool 1 hour or until completely cool. Remove cake from pan. Blend ingredients together. Substitute for regular flour. NOTE: The original cake recipe calls for 1 cup sifted cake flour. I substituted the gluten free flour for the cake flour. This cake is delicious. I saw on Thrifty Fun that you can freeze egg yolks so after making the cake, I put each yolk into a section of an ice tray and froze them. After frozen, I put them in a ziplock bag. To test them for cooking, I took out 2 and placed them in the refrigerator the night before cooking breakfast the next morning so they could thaw. For breakfast, I mixed them with 3 eggs and scrambled them. They were very good. These yolks will not be wasted. Also, this cake freezes well. I sliced it into individual servings and wrapped each piece in seram wrap, placed them in a zip lock bag and put it in the freezer. This keeps me from devouring half the cake in one day. Frozen eggs yolks are also good poached. Let them thaw and then drop them into some simmering water for a couple of minutes. Delicious. I was just wondering if I had posted this recipe and saw that I have so now I'm just sharing a photo of it. 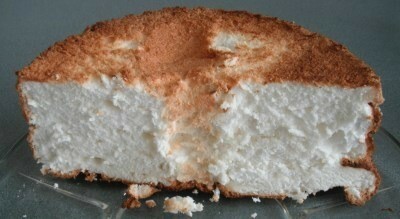 If you like Angel Food Cake, this is a good recipe. Editor's Note: We added the cake photo to the main recipe. To poach individual frozen egg yolks, you don't have to thaw them. Bring some water to boiling, then reduce the heat. Drop the frozen egg yolk into the hot water and simmer for 2-3 minutes, depending on how done you like them. Add salt and pepper to taste. I don't know how good they are for you but they surely are tasty.